Tempels Khao Takiab en Khao Tao. The driver takes you to Temples and beach and waits for your return. First the driver takes you to the Khao Takiab temple. This temple is on top of a hill and accommodates a lot of monkeys. You'll find nuns and tourists are feeding the monkeys with bananas. You can buy fruit from the nuns in white dresses and feed the monkeys. Keep your camera ready to picture monkey mothers with their offspring. Or watch their acrobatics, climbing the walls, roofs, electricity poles, etc. After Khao Takiab the driver takes you to Suan Son Beach for lunch. This beautiful beach has a lot of pine trees which provide shade for its visitors, it has mostly local people visit in the weekend. Sit down, relax and have a nice meal and cold drink ordered at the buffet. 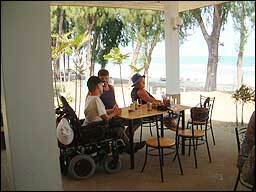 During lunch you have a nice view over the beach and the Gulf of Thailand. 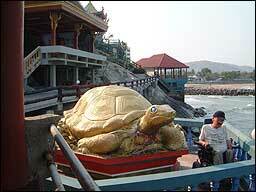 Khao Tao means Turtle Mountain. That is where the driver takes you next. The temple has a big Buddha and big turtle statue. It is a very colorful temple where monks still live and pray. Please behave respectfully towards the monks and the temple rules. 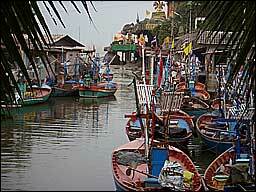 The small harbour of Khao Tao is also very beautiful.